HEAPS to get through today – a not so innocent rant and a reminder of not being devalued and lots of love for The Knitting Goddess’s new One Farm Yarn. This month KnitBritish is sponsored by Joy dyes luxury yarn in her studio in Harrogate and is committed to supporting British wool in all her bases. In addition to incredible yarns, such as Britsock; Wensleydale & Shetland; BFL & Masham Sparkle and BritSilk, you will now find the amazing One Farm Yarn and you’ll hear more about it in today’s show. Sign up for Joy’s newsletter to find out when the 2018 Clubs are available and for weekly updates on what’s going in the shop! The Good Intentions are cracking away like Billy-oh! Well done, all those taking part. Check out the Ravelry thread to see what everyone is making. On the topic of Ravelry, I had cause to be a bit pissed off this week! When we have giveaways I always have very simple rules and when its a yarn that’s up for grabs, I usually ask you to name a pattern you would knit in that yarn and link to it. I ask this question because I think it is nice for the person giving the prize to see what you imagine making in it. I’m pissed off, as last week I drew the winners of the Blacker Brushwork prize and I had to re-draw it three times because those folks drawn at random hadn’t answered by doing this. It is really easy to link to patterns on rav: You can physically copy and paste the pattern page link into your reply OR you can do a quick link. And ravelry shows you how to do this at the top of every reply you make. We’ve been really lucky to have had a lot of giveaways recently. I want to keep on offering these, so please read the entry requirements, which are always in the 1st post (and usually at the top of the thread page too) and enter accordingly. “I love this yarn, I hope I win!” isn’t what you’re asked to comment with. If someone is going to the effort to give away their stock as a prize, and they post it to me and I have to post it to you…take a few minutes to enter in the way you are required, or don’t bother entering at all. Thank you. Thanks Lynne! You made me so happy the other day when you commented on the shownotes of the last ep to say that you usually listen on an app, but you listened on the website and loved the shownotes! I know lots of you listen via podcatchers and never visit the shownotes here, but those of you who do listen here will know that I never like to leave scant notes, which are just a list of links. I like to make the post make sense on its own. So Lynne, thank you for making my day! The Innocent Big Knit (I’m not linking to it, google it, if you want) has reared its ugly tiny be-hatted smoothy bottle head again. If you don’t know what this is, Innocent drinks – AKA COCA-COLA (a very important fact, I think) – ask knitters to make tiny hats, which they sell on bottles, which raise awareness of Age UK (Very happy to link to them!). A sum of 25p per bottle (it used to be 50p!) goes to the charity and they say they raise £140,000 per year for the charity. 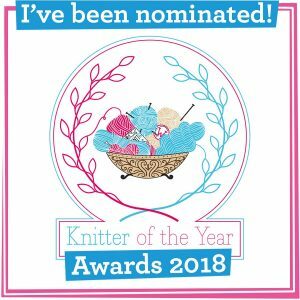 Joy McMillan wrote a great post on this and voices concerns may of us feel on this gimmick (and my good mucker Felix wrote about the other issues with the big knit a few years ago, at Wovember). I’ve spoken before about the worrying idea that PR companies and businesses working on behalf of charities believe that knitter’s are fair game. I mention this post by Rachel Atkinson from a few years ago, in relation to this. Their logic seems to be 1) They can knit and have skills we do not. 2) Knitters knit all day long (don’t they?) so are ready for the call to action 3) we can make money or a big PR splash with this. There are lots of opportunities for us to make and give to charity. We understand “knitworthy” and know that there are people all over the world who will get comfort from what we make. We are skilled craftspeople. We constantly fine hone our skills in each item we make. We need to stop knitting from being devalued by companies like Coca-cola and we need to stop letting our skills be devalued by gimmicks like the Big Knit. Innocent/Coca-Cola could still donate 25p per bottle to Age UK, they could still raise awareness and promote Age UK and they could dispense with these stupid hats. Coca-Cola, also, by the way, have BILLIONS in profits – maybe a nice fat annual donation to Age UK anyway wouldn’t go a miss. Just saying! And what about us? How can we help Age UK without knitting hats, or buying a bottle of smoothy with a hat on (that will end up in landfill, probably!) Well, we can donate ourselves right now. We can also read the information there about the real issues facing the elderly in the UK. 200,000 older people say they haven’t had a conversation with friends or family for a month. This winter, 25,000 older people could die prematurely from the cold. That’s over 200 preventable deaths a day. If we are so inclined to knit for charity – and I totally understand that some of us are charitable in a great many varying other ways and don’t want to and that is fine – let’s make something that might actually keep someone physically warm with the value and support we can we can give in our stitches. I really wanted to come on here with a list for you of charities who collect and distribute knitwear for the elderly and those suffering fuel poverty, but most are just not in a position to do so. This is the info I can give you. Shelter have said that they can sell your knitted items in their shops. AgeUK said that they have local community teams who may have individual needs. If you are in Edinburgh, The Edinburgh Clothing Store work on a referral basis from agencies and charities to give those who need it, clothing and bedding . Ask your local care home, hospital or your local council if they need knitted items. Most importantly, if you want to make something for charity, check out KnitForPeace. They will ask for and distribute specific knitted goods to where they are needed most, all over the world. 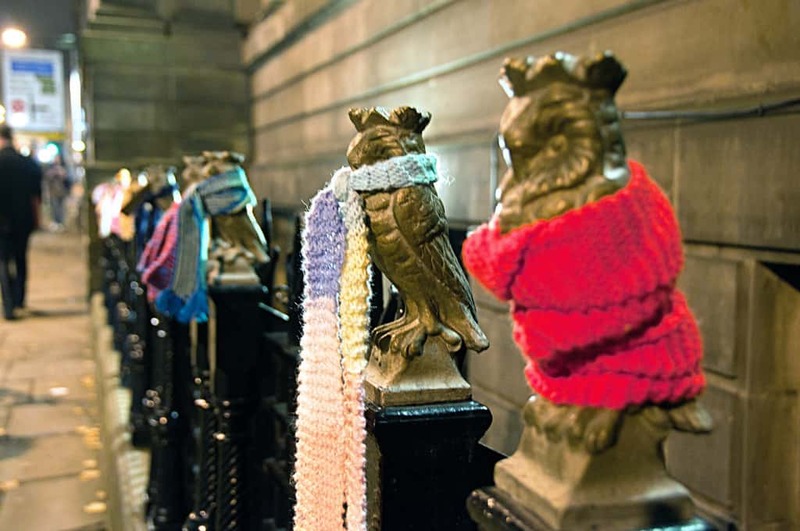 Their Keep Britain Warm Campaign asks for your squares to be made into dressing gowns for the elderly. I do not doubt that the money from the big knit goes to a good place, but without the gimmick the money and awareness could still be raised. Let’s not have a drinks company ride on the crest of our skills. I’m so excited to be able to talk about One Farm Yarn, Joy’s newest custom spun yarn which has been from field to dye pot in about 70 miles – a properly LOCAL wool. The wool is a blend of BFL and North Country Mule, which is a cross between BFL and a Swaledale. Remember last year when I went with Joy and Bobbie to visit a farm? (the one with the goat?) well, it’s flocks wool from there. The farm is at Fiddlers Green (they were at Rigmoor when I visited) in Harrogate, and the fleeces of their BFL and Mule sheep travelled to Haworth Scouring, Laycock for carding, Laxtons for spinning and then to Joy to dye. The wool never leaves Yorkshire. Look at those photos and see that lovely light, misty halo and that beautiful ply! That made me melt, when I removed my mini skein from the package. It is a delicate-looking twist, but its not a loose yarn, it looks very similar to the worsted Shetland Heritage yarns to me. I call this yarn “whisper-like” and its has a lovely texture in the skein and in the knitting. There is a light crispness, but it very much feels like a soft, velvety rose petal. I knitted garter and lace in this swatch and I loved how lace looks – this begs for all your lace. It blocks like a proper good un! i cannot find my blocked swatch, but will add a pic here when I do. LOOK at those garter bumps! This was a delightful little mini skein of yarn from Joy. 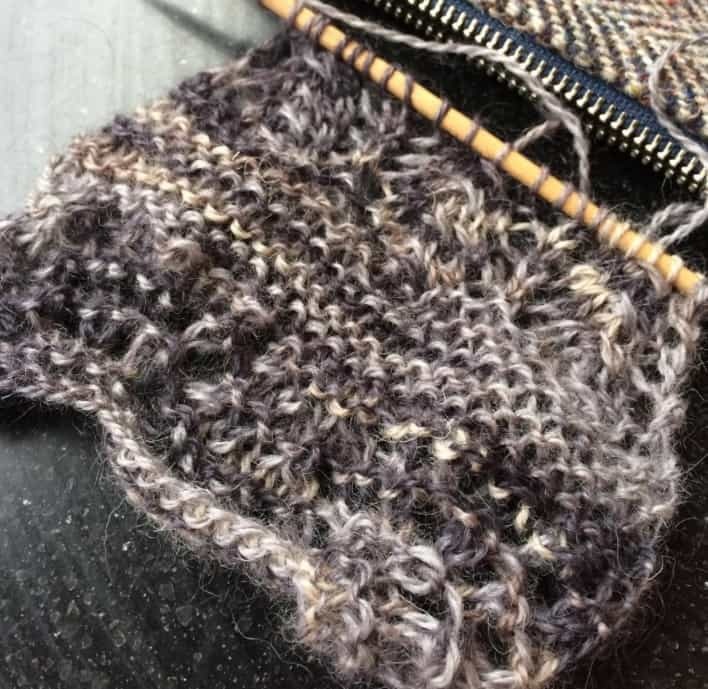 One of the first things I should say was that I was so excited I kept trying out and messing up about 4 swatch patterns, so in addition to its beauty it is one hard-wearing yarn which, despite its softness and halo, bears much tinking and unravelling! Its a real sensory experience working with this – the scent is deliciously sheepy. It is a beautiful texture – so soft and yet holds it own weight. I eventually tried a swatch in an open lace grid pattern because I wanted to see how it held shape (very well) but even now I know it will be reworked into something with stocking stitch because I want the colours to shine. This yarn – as described by Joy, would be a bonus in any project bar working socks… I am hoping to score some at yarndale (along with the amazing irn bru orange colour) for a shawl but a special 4ply sweater such as Boxy or something by Veera Valimaki would be amazing. 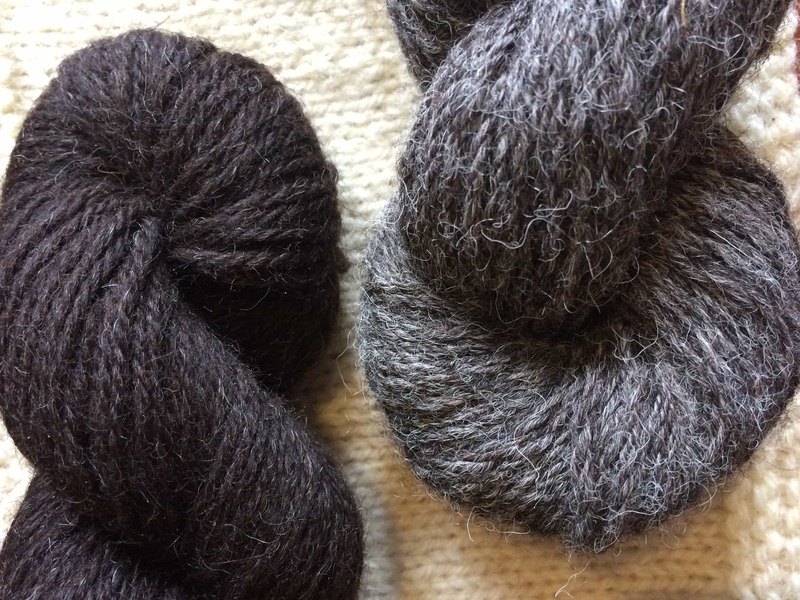 Overall, though, the most special point about this yarn is its’ provenance – minimal yarn miles, supporting smaller scale businesses in farm, spinner and maker. The ethics of it are as important to me as how it looks – a yarn with a real story about real people doing a small but important thing. 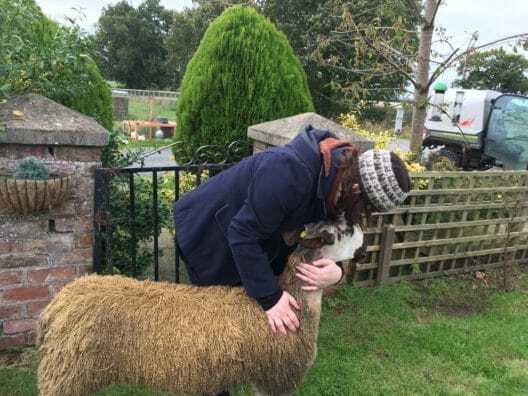 I absolutely loved the one farm yarn, I love the concept of a yarn that can be traced right through from sheep to dye pot and all kept within a small local area. When the purple packet came through my letter box and I opened it up, I was welcomed by the most wonderful sheepy smell. Joy had sent a great information sheet about the concept and process which was great to read and the ball band info was perfect. Joy had sent me the grey colour way of One Farm Yarn which was perfect as I’m a massive fan of grey and I loved the colour variation. The hand-squish-grab was great. 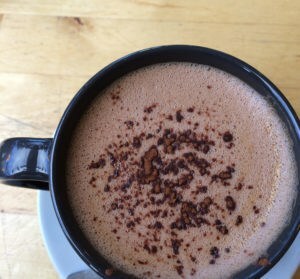 It felt soft with the slightest bit of crispness that I like to feel in a yarn. I knitted up another Tin Can Knits Vivid pane which I find is really good for a swatch as it has garter, stocking and some Lace work too which gives it a good detail. So it works really well for a yarn test because I can see easily what works well, and I can confidently say all of the above! I don’t think it would work well for colour work as it looks so well on its own. I particularly love the effect that the yarn has in stocking stitch. It is a 4 ply but is on the lighter side and reminded me more of knitting with Jamiesons ultra. It was incredibly smooth and easy to knit with. It was a perfect knit to do while I was on my travels with work and garnered a few comments while I knitted with it on a flight to London! I definitely want some of this and think for something light and drapey it will work well. Thanks Joy and Louise for letting me test this, it’s really lovely to work with. Swatch: knitted beautifully, amazing definition. Soft and misty with that halo. Blocked incredibly. Best suited to: LACE! Try Hitofude cardigan or a Talavera. You can buy One Farm Yarn with 10% off, thanks to Joy. Til 11th November use KBONEFARMYARN. Please be advised the code is *just* for One Farm Yarn and no other TKG yarns. Next month the 2018 Club sign ups will open for The Knitting Goddess yarn clubs. Clare Devine is working with Joy again for the sock club AND there will be an exciting shawl club too. Do sign up to Joy’s newsletter to be kept informed of the important date. And check out Joy’s new venture That One Perfect Thing. You already know Joy’s talent for making and screenprinting project bags and now she’s taken that to a whole new level. Made from rufty-tufty duck canvas, you can sling your knitting in one of these amazing utility bags and take it out in all weathers…or, you know just use it indoors too! The design of the roll-top bag, on the right, is particularly amazing. Move over Field Bag! All of this from Joy and a One Farm Yarn giveaway too! Get on over to the Rav group to find out how you can win a skein of One Farm Yarn. And DO look at those entry requirements. Thank you SO much Joy! Sonja and I, photo: Malena Persson. Blacker Podcast Lounge planning is well afoot, for Edinburgh Yarn Festival (15-17 March). If you are a podcaster with a regular show (or vlog! ), and you are coming to EYF 2018 then you should hop over to the EYF website and register your interest for a podcaster pass. Every year there is a limited amount of passes for podcasters and filling in this form is the only way to register your interest. Please do not enter into any other correspondence for this. This year there were more podcasters at the event than before and the vibe was amazing, so do fill in that form! Look! Look at the Jumper bunting! LOOK! The link for the pattern is here. The pattern was designed by Sue Stratford for Save the Children. It is a free pattern, but if you would like to send Save the Children a quid or two, if you are so inclined, you can do that by clicking this link > > > DONATE TO SAVE THE CHILDREN. You can only get the pattern via the above link or from theknittinghut.co.uk/free-patterns. The Woolly Thistle, PO Box 312, Meriden NH 03770. Next month is the shape of things to come as I only have one episode in November. November is WOVEMBER and my desk is rather full that month, so I thought I would try and make things a little easier on myself. It will be a great dry run for 2018! And I will have some news about new year for you too. Swing back for the podcast around the middle of November and hopefully I’ll have an exciting couple of blog posts for you too! Music: Carefree by Kevin McLeod and Singin’ in The Rain (demo) by David Mumford – Both are on FreeMusicArchive and are both shared under Creative Commons Attribution license. Images are copyright to those attributed in the caption or in the accompanying information. Thanks to Joy who gave me a mini skein – and mini skeins to our muckers – for free in exchange for a honest review. Feature image is from Paul Stevenson on Flicker and is shared under creative commons. Fantastic notes – thank you for speaking out on this issue and to the in depth pieces about the folly of little acrylic hats. Some of the numbers that people have posted make you realise this is purely a marketing hype exploiting the good wil of skilled craftspeople. I would have thought better of innocent – once a small ethical company now obviously being run by a big marketing corporation. I’m hoping pukka teas doesn’t go the same way (recently bought by Unilever). And such a contrast to the 72 miles of one farm yarn. Brilliant. Enjoyable and thoughtful podcast as usual. Thanx Louise. I always find something to think about as well as sheer knitterly fun on your podcasts. And I nearly always read the show notes: I love following up the links. Rant on! from Jennifer, who listened while digging out yellow daisy-like weeds (called cape weed here) from her garden. Hi Louise, I normally listen through the website and I don’t always listen in order. Your show notes mean I pick a podcast with a subject,guest, yarn I’m interested in and are invaluable. Thank you for taking the time to put the show notes up and making them so concise. On another note totally agree with your rant on your bottle hat knits, everything I see the adverts I want to growl. I always listen to the podcast via the website. I have no idea what a podcatcher is and don’t expect to be enlightening myself on the subject any time soon. The KnitBritish website suits me just fine. I often read the show notes before, during or after an episode. They make a great information resource. Plus, they’re searchable if I think that I once heard something mentioned on the podcast but just can’t remember which episode. Another thought provoking and very enjoyable podcast. Rant away! Although I usually listen via iTunes I always read your show notes before, during or after listening, sometimes all three. I appreciate the time you’ve spent writing them. Hands up I don’t always read the show notes…….sorry will now be a reformed person..thank you for producing them in such detail. Not every pod caster does . 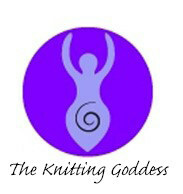 Off to order from The Knitting Goddess One Flock’ . 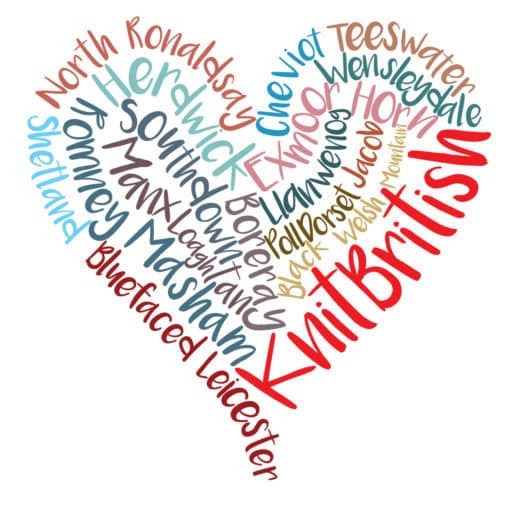 Thanks for all your efforts to promote the act of Knitting British. I love your podcast and it is true, your show notes are wonderful. My head was nodding, nodding, nodding as I listened to this one. I will NOT be knitting caps for bottles or sweaters for penguins -rubbish to those who do not value the hands that knit beautiful things. 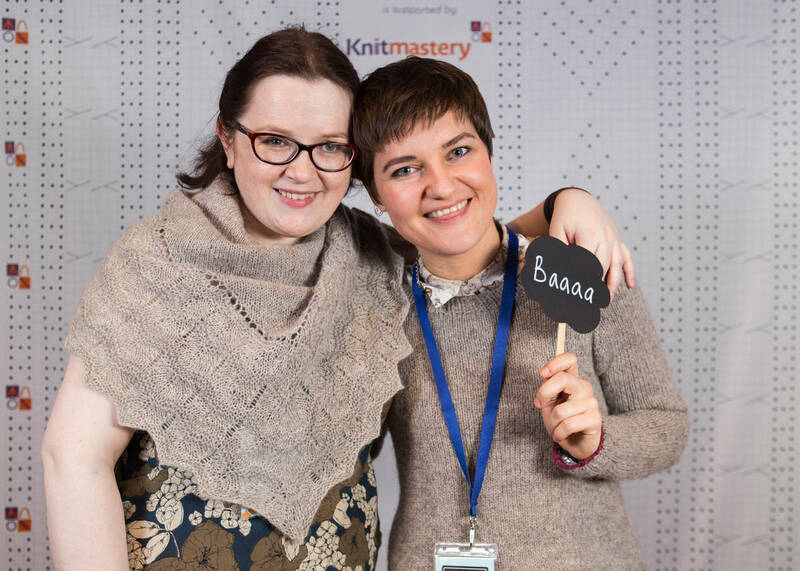 Thank you again and again for teaching me so much about yarn and knitting. Fantastic pod cast. Love the podcast notes as I couldn’t remember all that information without them. Thank you Mary! My squares are now winging their way to Knit for Peace. I will post the Knit A Square link in the KB group! As always, I enjoyed your podcast. I especially love your focus on locally produced yarns and the stories behind the products you include in your program. I really enjoyed the podcast — and funnily enough, not a few hours after listening, a video for Innocent’s call for hats popped up as I was looking at Instagram stories (I don’t follow them, it was clearly paid advertisement) But how insidious I thought! Clearly they’re paying to target knitters on social media — surely that money would be better spent going directly to AgeUK or another charitable cause. This was the first time I listened to your podcast and dad your notes. It won’t be the last! Thank you for The I formation about Innocents, I only found out very recently that they had sold out to Coca Cola! I listen on iPad, always via the website. The way I can press play and scroll down and read is the best 😀 I listen to other podcasts and when you click play, the show notes disappear so it’s faffy, and, as you rightly said, sometimes the notes aren’t that good a read anyway. And then as I listen, I go back and check the relevant pictures as you go along, it brings the audio to life, being able to see pics at the same time. I enjoyed the podcast as always, Louise, and the extensive show notes. When you mentioned that we should go look at them, I was listening in my car (with me driving) so I chose to wait until I got home! Man, I love it when you go off!! 😂😂😂 So true!!! Thank you for all your hard work and dedication to this amazing resource, Louise. As an Anglo/Hiberno/Erino-phile (Britophile?) I love hearing about all the wonderful British-based yarns and initiatives you talk about on your podcast, and try to support them how I can in the US. As well, thank you, thank you for the shownotes. I often come back to them months later, since I re-listen or go back to your previous episodes long after they’ve first aired, and even if I can’t take advantage of the time-sensitive information for giveaways, the links are always helpful. Thanks for posting a photo of the dressing gown made up of squares! I had a hard time trying to envisage how that would work – they look great, and most definitely a better use of resources, time and skill than knitting a hat for a bottle! One gets caught up in their every day life and its the tinyest of things that can brighten ones day. Im from Australia and planning a trip to Scotland. Being interested in knitting and wool fibre I wanted to research where I could go in Scotland to satify my desire. Your poscast came up somehow so I downloaded the last 4 and settled in to listen. Love your “spin”. Love the sound of the one farm yarn and was getting very excited over that. My brother, sisters and I have been planning an ancestral trip to Scotland for some time and we had only just settled on dates to suit all our calendars. Well I nearly wet myself when you mentioned the Edinburgh Festival was on the day after we fly in to Scotland. I am so excited you can’t imagine. So looking forward to my “hit” on the first few days of my first visit to Scotland…! Any tips would be greatly appreciated. Thank you. I have now subscribed to your podcasts. I think in another life I was a coloured sheep breeder. I get very excited about the different fibres and sheep breeds you talk about and have picked up my knitting with great excitement. I have put my name down for EYF newsletter and noted tickets available at beginning of new year. I always listen via your website as I like to look at the pictures you put up which enhance what you are saying, especially pictures of the swatches. I have just bought a skein of one farm wool to crochet in Fay’s (from the crochet circle podcast) Xmas Eve Cal so was delighted to hear more about it though a bit gutted I had missed out on the discount. It does feel like a gorgeous yarn. Previous PostReasons to be cheerful – TEXTURE!